"A Free Ballot and a Fair Count" examines the efforts by the Department of Justice to implement the federal legislation passed by Congress in 1870-71 known as the Enforcement Acts. These laws were designed to enforce the voting rights guarantees for African-Americans under the recently ratified Fifteenth Amendment. The Enforcement Acts set forth a range of federally enforceable crimes aimed at combating white southerners' attempts to deny or restrict black suffrage. There are several aspects of this work that distinguish it from other, earlier works in this area. 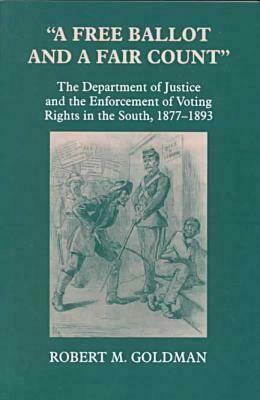 Contrary to older interpretative studies, Goldman's primary thesis is that, the federal government's attempts to protect black voting rights in the South did not cease with the Supreme Court's hostile rulings in U.S. v. Reese and U.S. v. Cruikshank in 1875. Nor, it is argued, did enforcement efforts cease at the end of Reconstruction and the so-called Compromise of 1877. Rather, federal enforcement efforts after 1877 reflected the continued commitment of Republican Party leaders, for both humanitarian and partisan reasons, to what came to be called "the free ballot and a fair count." 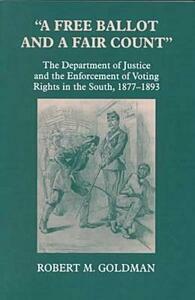 Another unique aspect of this book is its focus on the role of the federal Department of Justice and its officials in the South in the continued enforcement effort. Created as a cabinet-level executive department in 1870, the Justice Department proved ill-equipped to respond to the widespread legal and extra-legal resistance to black suffrage by white southern Democrats in the years during and after Reconstruction. The Department faced a variety of internal problems such as insufficient resources, poor communications, and local personnel often appointed more for their political acceptability than their prosecutorial or legal skills. By the early 1890s, when the election laws were finally repealed by Congress, enforcement efforts were sporadic at best and largely unsuccessful. The end of federal involvement, coupled with the wave of southern state constitution revisions, resulted in the disfranchisement of the vast majority of African-American voters in the South by the beginning of the Twentieth Century. It would not be until the 1960s and the "Second Reconstruction" that the federal government, and the Justice Department, would once again attempt to ensure the "free ballot and a fair count".